Manley LAB Series Preamplifier — Manley Laboratories, Inc. The Manley Lab Series Line Preamplifier was built from 1994 to 1998. At a retail price of only $1150 it was a simple entry-level unit. 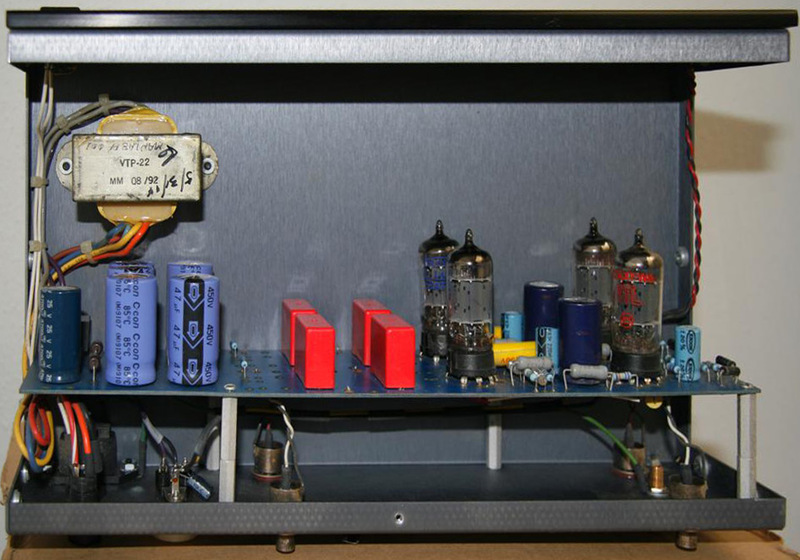 This unit later evolved into the Manley Purist Preamp which was later replaced by the Manley Shrimp Preamplifier. This unit was simple but nice looking with its anodized "manley blue" sheet metal chassis. Concealing all the boring circuitry was a perforated aluminum top cover. Polished black acrylic side panels were also a nice cosmetic touch. The circuitry was simple and pure vacuum tube. Tube complement was 1 x 12AU7 in cascade for the gain stage and 1 x 6414 or 12AT7 per channel. There were five line level unbalanced RCA inputs and a high quality detented volume control. The separate left and right balance adjust controls were actually variable feedback controls. Some models had a pair of toggle switches inside near the left rear of the main board to setup and select different gain by changing the first stage's cathode resistor. A pair of cathode follower buffered Record Outputs were provided. The Main Outputs also used cathode followers for the output drivers. This unit had a Mercury Magnetics power transformer. We rarely ever get these in for repair. Time has proven these to be nicely reliable little preamps. Also in the Lab Series was a Lab Delta Sigma DAC at $1150 and a Lab Series All Vacuum Tube RIAA MM Phono Stage for $950. Pretty simple circuit, been done a million times before, with the RIAA EQ Decoding in the tube stage's feedback. MM input only. The Lab Series Phono Stage used 12AX7's for the RIAA section and 12AT7's for the cathode follower output stage. Rest In Peace Lab Series!